A healthy, active cat that never leaves the house ? If your image of an indoor cat is of a chubby layabout that couldn't hunt his own dinner if his life depended on it, think again. Given attention and the right care, an indoor cat can be as lively and energetic as even the most street-savvy tom. Many of us have understandable reservations about keeping a cat in an essentially unnatural environment and would feel guilty about their pet missing out on his freedom - and I admit, as the owner of an indoor cat myself, such scruples do cross my mind from time to time. But while the benefits of keeping a cat to the owner's general happiness and stress-levels are well known, you won't have to worry that your indoor cat is getting a raw deal if you meet their needs and put a little work into keeping them entertained. In fact, without anxieties about dangerously busy roads, lost cats and some acquired illnesses taken away, the whole experience of cat ownership can be safer and more enjoyable for both parties. Armed with a little know-how, you'll be ready to give your indoor cat a happy home and feel good about it too. The first step is to ask yourself how much time you have available to spend interacting with an indoor cat. As they will not have the same outlets for their instinctive needs as outdoor cats, who gain stimulation from nature and the seasons - not to mention wildlife - they will be reliant on you to provide the majority of their entertainment and play. The next part is choosing your cat wisely - animals that have previously enjoyed an outdoor lifestyle may not take well to the change, but others can actively benefit from being indoor-only. Cats with FIV Feline Immunodeficiency Virus) cannot socialise with non-FlV cats so have to stay in the house and deaf and blind cats would also be suited to an indoor-only environment - so adopting from one of these groups would be ideal. Also, cats that are particularly nervous or have had frightening experiences with a member of the local feline population might be good candidates for the great indoors too. Indoor cats tend to have less opportunity for burning off calories, so ask your vet for advice on which food would be best suited to them. Inevitably, weight issues can be a major cause for concern and it is important not to over-feed them - follow the guidelines and use a measuring cup for dry food rather than pouring directly into your cat's bowl. Getting hold of some cat grass - Cocksfoot - which grows quickly from seeds in a plastic tray - available from pet shops - is a must to help prevent your cat nibbling at your houseplants, although I have found that keeping the growing grass away from my cat until it is long enough for her to eat can be a battle of wills - she seems magnetically drawn to this wide-bladed grass. On the subject of plants, indoor cats can be particularly interested in the potted plants and cut flowers that might be around them in the home, so it's very important to protect your cat from ingesting potentially toxic foliage - check out the Feline Advisory Bureau for a full list of dangerous plants at - http://icatcare.org/advice/poisonous-plants. Lilly pollen is a particular danger as it can cause kidney failure, so stay vigilant and always be conscious of what you are bringing into your cat's environment. As for water, my cat definitely prefers perching on the side of the sink and drinking from a running tap than from her water bowl, with lapping from my bedside water glass a close second, so you might want to consider investing in a cat water fountain to keep them happy and hydrated. It's also a good idea to have more than one litter tray for your cat - perhaps not double the fun for you, but it might prevent the odd unwanted gift being left on the floor or in the bath. Trays should be kept in separate, secluded locations - a quiet corner of a room that is easily accessible to your cat is ideal. 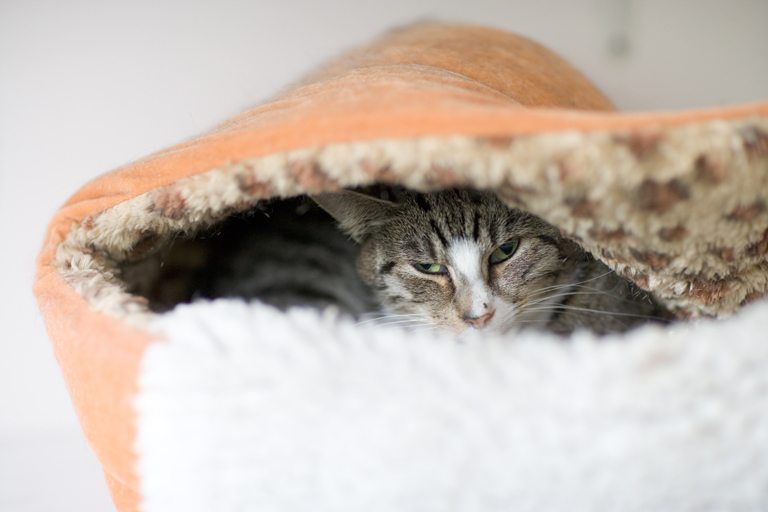 Even though you may think your indoor cat is unlikely to get lost, getting them microchipped and vaccinated is a must as cats can easily sneak out when doors are left open for a moment and, with no knowledge of their local area, would struggle to find their own way home. You will also need to screen open windows and gaps in balconies with fine wire mesh to protect your indoor cat from falling. A scratching post is an essential purchase to avoid damage to your furniture and these can range from a basic structure to more elaborate and taller poles with integral toys and seating platforms, which your cat may either love or ignore completely. The most appealing scratching posts to cats are nice and sturdy so the cat can lean against them with his full body weight without the post wobbling, tall enough for them to have a good stretch and have a vertical thread which feels good as he scratches down the post. If you find your cat does ignore the post, try changing the location. Cats generally like to stretch and scratch when they first wake up, so try putting the scratching post near to where they sleep. Giving your indoor cat a range of places to investigate within your home is a great way of keeping them happy and enabling them to vary their daily routines. As well as allowing them several private hiding areas where they can retreat when they are in a less sociable mood, it's a good idea to help them access high resting places, which adds to their feeling of security. This might be on top of a wardrobe or cupboard, so have a look around your home and scout out any cat-friendly high points, making them as easy as possible for your cat to reach. A radiator bed has proved a hit with my cat, who also sleeps on a regular cat bed on top of my filing cabinet and on the back of the sofa. Too much sleeping, however, could be a sign of a bored and under-stimulated cat, so play and entertainment should be regular components of your cat's daily life - although don't wake your cat up to play as they may not appreciate such an interruption. There is a wealth of pet toys available to buy, but be aware that cats can easily get bored with the same old toys over time and, like the kid at Christmas who spends more time playing with the wrapping paper than the toy inside, makeshift games are often the best of all. If you observe your cat closely you'll soon realise which items make the most exciting toys for them - my cat adores scrunched up foil and paper balls flicked along the carpet or her to chase and has a particular fondness for any cardboard box that comes into the house, jumping in and out and nestling inside to sleep as the fancy takes her. Rustling paper carrier bags with the handles removed for safety also intrigue her, as do scrunchie-style hair bands, under my supervision of course. When you go for a walk, keep an eye out for natural items such as feathers, stones or shells to offer your cat as new objects to investigate and play with. A park or garden is also a good source of materials to make toys for your indoor cat, such as a fishing rod- style stick with feathers attached, or you could use scraps of material attached by lengths of string to an old coat hanger for your cat to bat at. Any form of movement twitch mimics prey tends to be popular, which might explain why an unsuspecting owner's feet moving under bedclothes are often pounced upon or swiped at by cats in hunting mode. However cute this seems, especially in kittens, it's unwise to encourage his form of play as adult cats can deliver painful scratches. You could also try making a puzzle feeder for your cat to challenge them to put more effort into obtaining their food treats, much as they would in the wild. Construct your own from a small, sealed cardboard box or tube with paw-sized holes cut out. Or, if you fancy giving your indoor cat a taste of the outdoors from the comfort of the sofa, there are numerous 'cat- sitter' DVDs available which feature prey animals in their natural environment, at an adjusted colour balance especially designed for cats. So although the life of an indoor cat is always going to be different from that of a free-roaming hunter, a house can be an ideal environment for meeting a cat's need for comfort, security and care, and with regular games, human interactions and comfortable perches for watching the outside world, there should be no room for boredom. By keeping a cat's-eye view of objects that would make great toys, of potential hiding and clambering spots, and of ways to keep them safe and healthy, you can rest assured that you have done your very best, leaving your cat to relax and enjoy the good life, safe and sound indoors. You can read more about indoor/outdoor cats in our essential guide by clicking here.